This is the first time I try to change my tires on a Honda. I used to have VWs all I did is to loose four nuts pull the winter tires out install the summer tires and screw back four nuts and that's it. In my 08 Honda in addition to the five nuts I see there's a big center nut,I don't know if I need to loose this one or not. For I see there's a nip on a groove and it seems I have to pry it open in order to loose the big center nut. Or may be I don't need to loose the big one. I should just hammer the tire/wheel out. It looks tight. Opions ? LOL That middle nut is your Axle nut. No need to remove it to change wheels. Just the 5 nuts surrounding it. Lastly, you were able to remove the wheel and take a picture of the hub without taking the nut off, why would you think more items need to be removed in order to take the wheels off? Actually, that looks like a steel wheel to me. But I'll second cvcrcr's note that the big nut doesn't come off (it's an axle nut). If the wheel doesn't want to come off when the lugs are removed, it's probably rusted to the hub (which is a common problem on a lot of cars, and steel or aluminum wheels). And judging by the amount of visible rust I see, I'll bet that's what it is. The easiest thing is to grab the tire on both sides, and try to twist it off (push one side toward the car, and the other side toward you. If that doesn't work, you can use a foot to kick the tire. If that doesn't work you can try a wooden mallet on the tire. 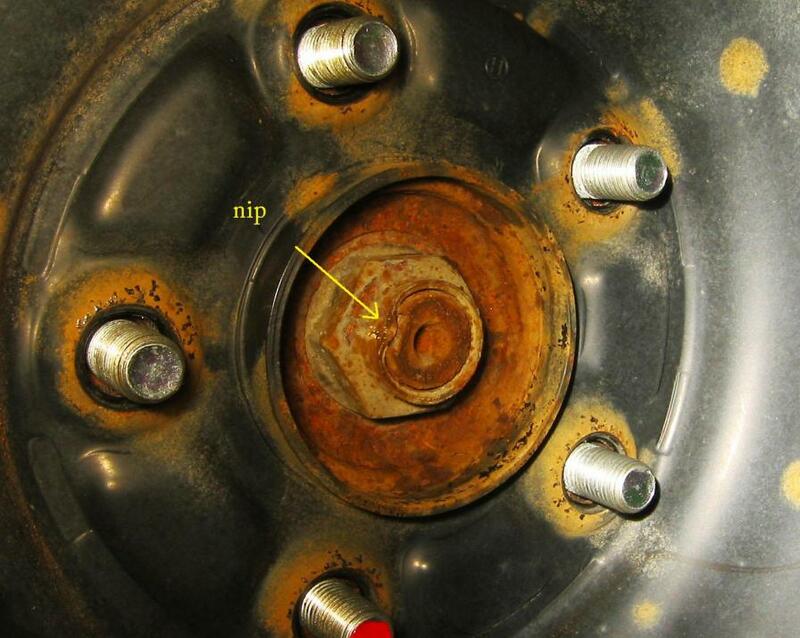 Once you get the wheel off, use a wire brush on the hub and the back side of the wheel to get any loose rust off. Then, before putting the wheel back on, put some anti-sieze compound on the back side of the wheel and the center hole where it rests on the hub. It'll go a long way toward keeping rust out of there again. Last edited by ChristianL; 03-30-2012 at 12:05 PM. center hole and waited couple hours to let it work into the rust. And then pulled and yanked much as I can and well it came off. Now 1 down 3 to go. Summer Job = Summer Fun. Need mod suggestions!